One Thousand and One Nights is the theme for May, and the host is... me :-) It is my first time to host a theme/month at the Bundt Bakers group and to be honest, it took me more time to read everything I had to do (and how to do it ;-) ) than thinking about the recipe :-) But it was fun, specially thinking about a theme! Las mil y una noches era nuestro tema para el mes de mayo, y la anfitriona era... yo :-) Ha sido mi primera ocasión para idear un tema de Bundt Bakers y, para ser honesta, me costó más tiempo leer todo lo que tenía que hacer (y cómo hacerlo ;-) ) que pensar en la receta que iba a usar :-) ¡Pero ha sido muy divertido, sobre todo lo de pensar un tema! "Let Scheherazade's tales ensnare you as they ensnared Shahryar. Let them inspire you to bake something with the most suggestive ingredients from Arabic, Persian and Indian kitchens. Use pistachios, almonds, dates, raisins, cashews, spearmint, saffron, cardamom, rosewater, orange blossom water, figs, dried apricots, coconuts, sesame (obviously!)... anything you would expect to be served at Aladdin and Badroulbadour's table, while belly dancers entertain them and their guests." On top of the cake I used a thick sugar syrup made with orange juice, sugar and a bit of water. Por encima del bizcocho vertí un espeso almíbar hecho de zumo de naranja, azúcar y un poco de agua. Can't wait to visit all the beautiful, Arabian, Persian or other One Thousand and One Nights bundt cake! Thanks everyone for participating! Precalienta el horno a 170℃ y engrasa un molde de bundt cake con espray para hornear o con aceite. Preheat the oven at 170℃. Grease the inside of a 10 cup Bundt pan. Pon el azúcar y las ralladuras de limón y naranja en un cuenco grande, y frótalos hasta dejarlos bien aromáticos. Añade la harina, almendras molidas, levadura química y sal, y mezcla bien. Machaca en un mortero las semillas de cardamomo, después de pelarlas. Añadelas a la mezcla de harina y azúcar y mezcla bien. Añade los pistachos y orejones picados y mezcla bien. Put the sugar and lemon and orange zest in a large mixing bowl and rub with your hands until it smells lemony/orangy. Add the flour, ground almonds, baking powder and salt and mix well. Place the cardamom pods in a morter and crush them (after peeling them) finely. Add them to the flour/sugar mixture and mix well. Add the chopped pistachios and dried apricots to the dry mixture and mix well. En un cazo pequeño, calienta la leche y añade el azafrán. Déjalo en infusión unos 10 minutos. In a small saucepan, heat the milk and add the saffron strands. Let infuse for about 10 minutes. Pon el yogur, los huevos, el extracto de vainilla y el agua de rosas en otro cuenco, y mézclalos bien. Añade la leche (enfriada, o tibia) con las hebras de azafrán. Añade todo a la mezcla seca, mezclando lo justo para que quede bien combinado y no queden trazas de harina seca. Añade el aceite y la mantequilla fundida, y mezcla lo mínimo necesario. Put the yogurt, eggs, vanilla extract and rose extract in a seperate bowl and whisk until thoroughly combined. Add the (cooled - luke warm) milk with the saffron strands. Add to the dry mixture and mix until just combined and no trace of dry flour remains. Fold in the oil and melted butter. Vierte la mezcla en el molde preparado, alisa la superficie, y hornea durante 50-55 minutos, hasta que puedas clavarle un pincho de madera y sacarlo limpio. Deja el bizcocho enfriar en el molde, sobre una rejilla, durante unos 15 minutos; después invierte el molde para sacarlo, y déjalo enfriar completamente. En un envase hermético a temperatura ambiente, se conservará bien hasta dos días. Spoon the mixture into the prepared cake pan and bake for about 50-55 minutes. Let the cake cool in the pan on a wire rack for about 15 minutes, the invert the cake onto the rack and let it cool completely. The cake will keep in an airtight container at room temperature for up to 2 days. Mézclalo todo en un cazo pequeño y llévalo a ebullición. Déjalo hervir 5 minutos, hasta que tengas un espeso (y delicioso) jarabe de naranja. Déjalo enfriar un poco y moja el bizcocho, aún caliente, a tu gusto. Put everything together in a small saucepan and bring to a boil. Let boil for about 5 minutes until you have a thick (and delicious) orange syrup. Let cool for a bit and drizzle over the cake (still warm). Great flavors in your cake! 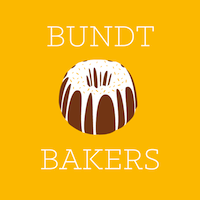 Thanks so much for hosting this month and giving us an interesting theme for our bundts. Thanks Renee, it was really fun to be a host! Con todos esos ingredientes seguramente al comer un trocito me teletransporte al mundo de los Marajás esos...jjj...Besines. Muchas gracias guapa por tus amables palabras!! Besitos! Muchas gracias Bea y Mara!! You did a fabulous job as hostess! I loved the theme and your cake is magnificient. Thanks Terri for your kind words! Wowww!! Maravilloso Lara!! Has elegido un tema estupendo y has sido una anfitriona fantástica. Ya me estás animando a serlo yo, jeje!!! Te ha quedado un bundt de infarto!! Me encanta ese molde!!! Lo quiero!! Besotes, guapetona!! Muchas gracias Patricia!! Me alegro mucho de leer que te ha gustado el tema!! A ver si tienes ganas de ser también una vez anfitriona ;-) Y sí, el molde es un regalo de mi marido (jeje, parece que todavía me quiere ;-) ) como sorpresa, y la verdad es que quedó superbonito!! Nos vemos!! Besos! What a beautiful cake, Lara! It certainly does deserve its wonderful name! Thank you so much for hosting this month. Wow...beautiful cake. Thanks for hosting and choosing such a fun theme Lara. Such a wonderful cake Lara, thank you for hosting and for choosing such a wonderful theme.